"The South Shore Center on the Lake was an organization of organizations. 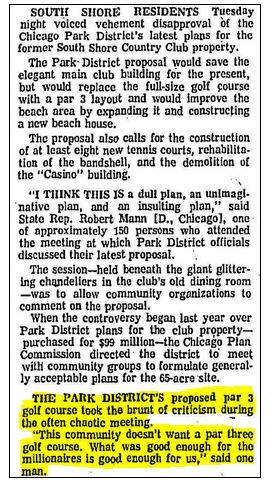 It consisted of the Jackson Park Highlands Association, the South Shore Commission, former Country Club members, and residents." The South Shore Center on the Lake was instrumental in having an application sent to the National Park Service so that the South Shore Country Club would be listed on the National Register of Historic Places.